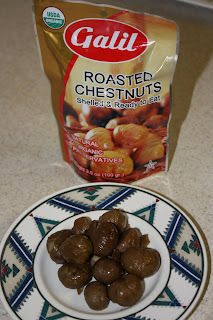 Food Adventures of a Comfort Cook: Bag of Chestnuts. While grocery shopping at City Market in Moab, I happened to see a display for Galil Roasted Chestnuts. 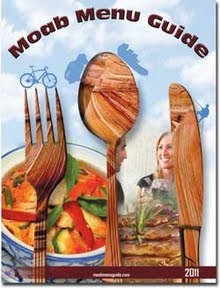 It is a product from China that is 100% organic, no preservatives, shelled and ready to eat, or use in a recipe. Looking at the photo on the package, it reminded me of childhood days of oven roasted chestnuts; peeling off the tough outer shell and hoping not to get splinters to get to that luscious nugget inside. Warning, what you see on the package is most definitely not what you'll find in the package. 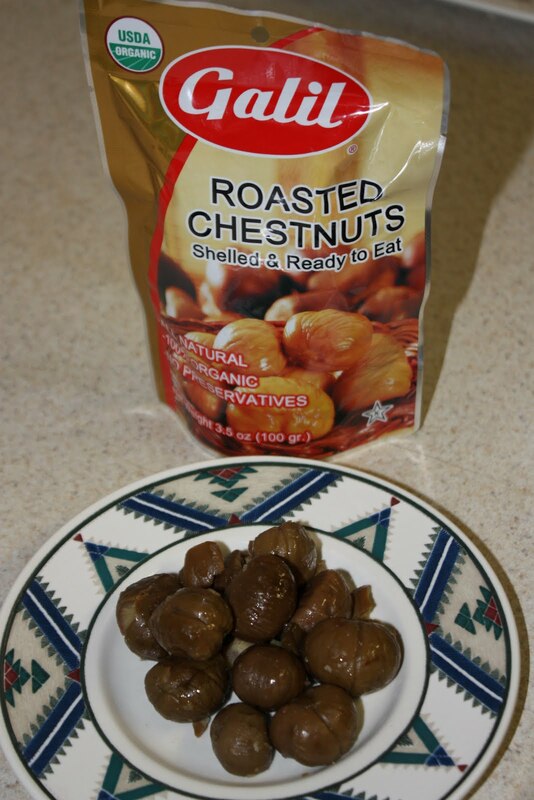 The chestnuts are a dull grey color, wet with a slight slimy feel to them; that lovely brown color is only on the packaging. I was brave though and tried one; surprisingly it had that strong chestnut flavor that comes from oven roasting. It is recommended that the product be refrigerated after opening. The next day I tried another; the wet sliminess was gone and the full flavor was still there. Personally, I find they will take time getting used to snacking on due to the grey color; it's very unappetizing to look at. Another use for these chestnuts would be in a soup, either for a holiday meal, or just for a cold, wintery warmup. The packages are 3.5 ounces, so you would need 4 packages for the soup recipe I'm going to post here which is mine, not from the Galil company. In a large soup pot, melt the butter on medium-high heat; saute' leeks, celery and carrots until the leeks become translucent. Add in flour, thyme and half n' half; bring to a boil and stir till thickened. Add in broth, chestnuts, paprika, nutmeg, salt and pepper; bring to a boil. Reduce heat to low and let simmer for 30 minutes; stir occasionally. Using an immersion blender, or transferring to a tabletop blender, process soup until smooth. Note: toppings such as a drizzle of sour cream or crumbled bacon can be served with the soup.